Sub: Revision of hourly rates of Incentive Bonus and Bonus Factor of Workshops/Production Units following implementation of 7th CPC Pay Matrices-reg. Ref: (i) . NFIR's PNM Item No.l2/20l7. (ii) Railway Board's letters No.ERB-1/20I7/23/39 dated 06/07/2017 &18/05/2018. 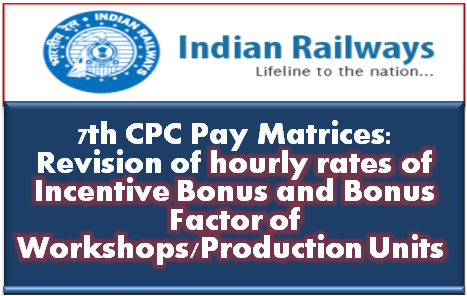 The 1st meeting of the Committee to discuss "revision of hourly rates of Incentive Bonus and Bonus Factor of Workshops/Production Units" was held at Rail Bhavan, Room No. 341 this day, 04th June, 2018. On behalf of NFIR, General Secretary, AIFIR and Shri K. Gobinath of ICFMS and SSE/ICF, have participated in the meeting. (a) Accepted formula for revising the rates of Incentive Bonus already adopted during 5th CPC Pay Scale period needs to be followed for making upward revision of rates of Incentive Bonus and Bonus Factor. (b) It was also urged that alternatively 2.57 Multiplication to the existing rates be considered for revision of rates with retrospective effect. (c) In the case of GIS pattern, the Bonus Factor should be not less than the minimum of the revised pay matrices. (d) It needs to be taken note of that the Supervisors and Staff (technicians/Helpers) are heavily overburdened due to drastic increase in the workload, therefore, there is no question of further reduction of allowed time. On the other hand, new posts are required to be created commensurating with the enhanced targets. (e) In the case of SSEs, Incentive Bonus @ 15% of 6th CPC rate is presently allowed. This quantum of amount is far less in comparison with the Incentive amount drawn by JEs, which is causing grave dissatisfaction among the SSEs who are 67% of total sanctioned strength of JEs/SSEs. There is, therefore, need to revise the existing rate of l5% to that to 30% of pay (7th CPC). After discussion, it was decided that the Committee will meet again on 04th July, 2018, by which time the required data will be collected by the Railway Board for useful discussions towards revision of rates. The above is for information of affiliates. It may also be noted that on finalization of record note of discussion, copy of the same will be circulated to the affiliates.